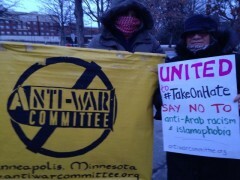 Minneapolis says no to islamophobia and racism, honors murdered Chapel Hill students | Fight Back! 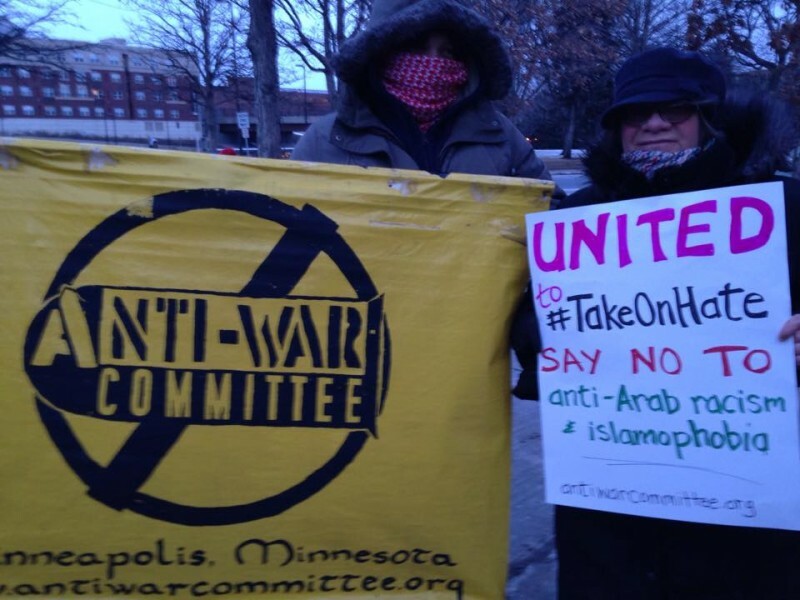 Minneapolis, MN - More than 50 people came out for a protest against islamophobia and racism, Feb. 17, in response to the killing of three Muslim students last week. Gathered at a busy intersection in the heart of the local Somali community, near the University of Minnesota campus, they held signs and chanted for an hour, as temperatures dropped below zero. Organizers sought to honor the lives of Deah Shaddy Barakat, 23, his wife Yusor Abu-Salha, 21 and her sister, Razan Abu-Salha, 19, who were executed by a neighbor in their home in Chapel Hill, North Carolina, on Feb. 10. While local police and media have said the murders were motivated by a parking dispute, family members of the victims say the crime was fueled by islamophobia and racism. Protesters slammed the media silence on this story in general, and the unwillingness to name racism and islamophobia as contributing factors in this case. Sabry Wazwaz of the Anti-War Committee led chants throughout the event, along with Caleb Murphy. The rally closed with brief remarks by Wazwaz, as well as Sahro Ismail, a member of the large local Somali community and Tarik Rasouli and Karmel Sabri, who are organizing a major event for Palestinian activist Rasmea Odeh. Some at the rally carried signs for Rasmea Odeh, and all were urged to attend Rock for Rasmea on Feb. 21 at Intermedia Arts in Minneapolis.